This is Etta. And me (I'm wearing purple). Our best guess of Etta's age is around eight or nine. In sheep years, that is reaching the esteemed period of Ancient. Five months ago, Etta arrived with seven other animals from a slaughterhouse. She was skinny and nervous, avoiding people at all costs. Who could blame her? Etta earned her name through what we call "Better Living Through Singing". Etta has a deep, resonating R&B style voice that booms across the sanctuary. We like to think that her namesake, Etta James, would appreciate Etta the sheep's lyrical style and would be honored. Or offended, since Etta the sheep cannot hold a tune and really only has one song to sing called "MEEEHHHHHHH". It's a catchy tune, really. After Etta opened up her voice pipes, she also discovered a burning desire for back massages. Etta may not be queen of R&B but she is empress of R&R. There is no sheep who loves a back rub like Etta. When you enter her enclosure, she'll stand at attention, gaze intently at you, sing her song "MEEEEHHHHH" and amble over. If you do not immediately offer up your hands for a massage, she will lean into you, ram her head ever so gently into your stomach and sing for you "MEEEEEHHHHHH". Sometimes she gets right in your face and stares really hard, trying to convey the obvious - where's my back rub? Who can resist such charm? As the picture shows, not me. Why did this lyrical genius end up at a slaughterhouse? It is hard for me to understand. I cannot imagine cooking her up and eating her - she is a being unto herself, full of her own sheep thoughts and sheep feelings, wanting to do her own sheep things. How could I deny her that for something I don't need, like her flesh? And even if I liked the warmth of her wool, there is nothing natural about it nor do I need it to survive. Etta's ancestors and her wild brethren have hair - it keeps them warm in the winter and naturally sheds in the summer, allowing the animal to remain cool. Humans bred domestic sheep to have constantly growing wool. It must be sheared to keep from growing and growing and growing. When that wool (or its lanolin) stops being useful for scarves (or lanolin-related pursuits), the sheep stops being useful to the farmer. Not a very healthy relationship for the sheep. Etta doesn't opine on these matters, unless they relate to whether the neck massage takes precedence over the lower back shiatsu (they generally don't). She lives in the here and now and perhaps the "where is my back rub?" future. There is nothing to remember and nothing to forgive because all that is good is now, here in this moment of physical bliss. I can't help but enjoy the moment too, even if Etta doesn't return the favor of a back rub. I have an honest question about wool. (honest as opposed to argumentative which some vegan people would undoubtedly take this question since I'm vegetarian.) Anyway.... I knit and live in a rural community. One of my friends has pet sheeps and since their wool does continue to grow she has to sheer them. I've helped her sheer them and it doesn't seem particularly stressful for the sheeps (a lot like giving the dog a haircut and trimming her nails really) but she does bribe them with mollasses covered oaty things while she is doing it. She's gentle but quick. What are the ethical considerations of using this wool for knitted items from a vegan perspective? Alternatively, but related, they have a house bunny who happens to be angora who gets brushed frequently (and looooooves it so much he will flip over on his back and stretch so you can do his tummy.) I've been learning how to use a drop spindle on the hair they collect from the bunny and would like to be able to stretch it out using some of the wool in the spring but I've been conflicted about it. The sheep at the sanctuary get sheered. It would be unethical of us not to. 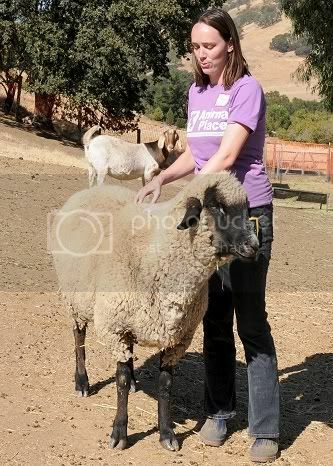 Only two of the sheep are a wool-type and every now and then a volunteer or staff member longs to knit with that wool. So every now and then we get it cleaned and spun so it can be used. Never for profit. The rest of the wool is dumped in the woods for birds and rodents to make nests out of. I don't know if that answers your question. There are those who would argue that the wool or hair of an animal is no more ours to use than their flesh or fur, regardless of whether they are companions or not. It's not a stance I personally take. I agree with you about something that I see as a natural byproduct which would harm the animal by leaving it on. (But I also tend to think that figs and honey are just fine too.) I'm not sure I'd go so far as companion, but they are really well taken care of farm animals. They won't ever become someones dinner. They come when called, and are put in the barn at night so they don't get eaten by wild animals. They are fed well and have several acres to wander and munch, and get vet care when they need it, so all in all a pretty good life. There are 2 goats, 2 sheep and one obnoxious donkey, who were all bummers and so bottle fed from birth. I find the goats more interesting as critters because they always seem like they are plotting some great mischief. All of that is besides the point really, because you did answer my question and now I can begin planning my super warm felted slippers. I really want enough room to have sheeps for fiber, so that I know my wool is humanely gathered. Wool is a positively miraculous fiber, with amazing advantages over synthetics (made with petrochemicals anyway) and even plant fibers (which tend to have no "memory" or give and can be quite hard to knit with, not to mention the unsustainable farming practices used for some of them). Also I just like sheeps. They're pretty fascinating if you take the time to get to know them. Although I strongly suspect that two sheeps would WAY over-produce wool for one knitter, and I couldn't have just one sheep as it would be lonely for the sheep. One bunny makes a lot more fibre than I thought possible. I can make a pair of socks from 3 months of regular brushing and a pair of mittens and a scarf when she blows her coat in the spring. I'm contemplating getting a pair of bunnies in the spring, I have a 3 sided shed in the back yard and could build a gated front out of wire to keep cats out, ramps and other neat things for a play area. I'm coastal so it rarely gets cold enough to freeze and 80 is an exceptionally hot day for us. these are so sweet... are they only posted here, or do they get posted in a few places? Thanks, I post them here and also at the sanctuary blog: http://www.animalplacesanctuary.blogspot.com. first this entry made me laugh. then it made me aaaaaw. then it made me fall in love with you a little bit more. as if that's possible!! Awww, thanks - I needed this comment today (as it was full of crap and sad). I've been vegan for six years and was previously vegetarian for about 10 years. That's such a sweet story. I haven't been out to visit the animals in far too long.